When you build a home, there seems to be a never-ending stream of decisions to be made. 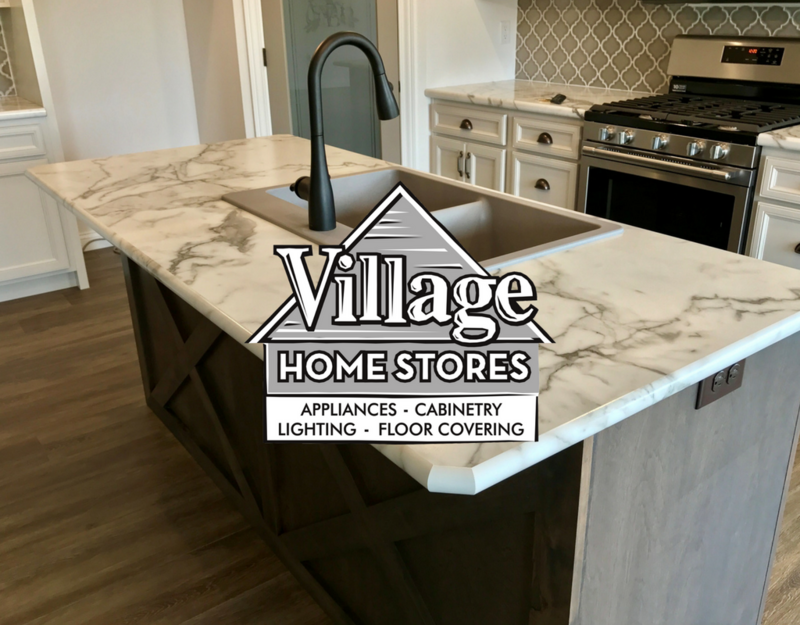 Village Home Stores is so blessed to work with so many of the region’s best builders. These builders allow us to partner with them and their clients to make the process as easy and enjoyable as possible. We form you a team of experts based on the products you need for your home. That team works together with you to help guide you to make the best choices for your lifestyle and the budgets you have set. There are so many areas of your home where you can make smart material choices and help get you the overall look and performance you want. 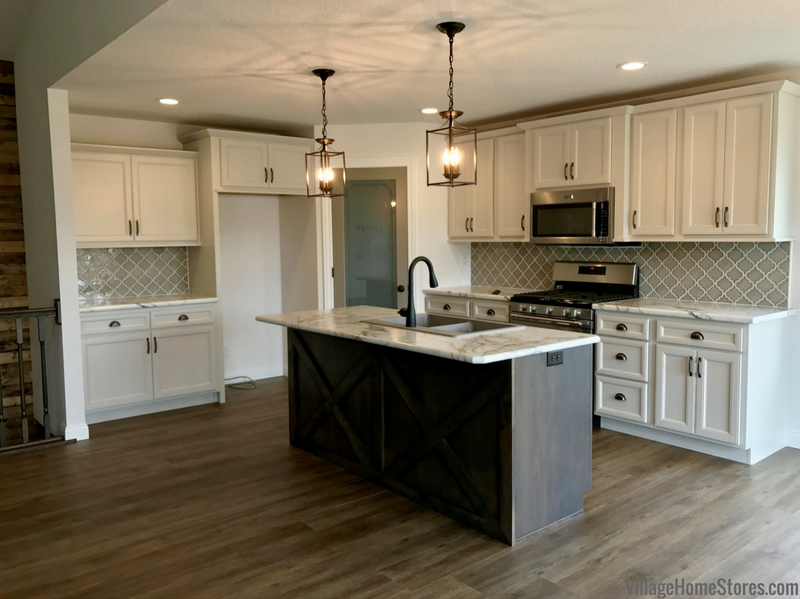 This home from Hazelwood Homes built in Colona, IL is a fantastic example of that! There are many elements that your cabinet designer will discuss with you to help pair your wish list and needs with the right products. That is why we carry so many product lines at various prices. We offer a wide variety of options so we can meet any budget or construction expectation. We designed the kitchen using our Koch Express line of cabinetry. The perimeter of the kitchen is in the “Lexington” doorstyle and painted “Oyster” finish. The kitchen island is in the “Camden” door in a Rustic Birch wood stained a “Stone” finish. The look and function (soft close doors and drawers were applied) of a semi-custom kitchen from our Express builder-grade product. Both the soft, bright gray color of the Oyster and the stained Stone island are right on trend. Another trend is the use of two medium-sized light fixtures above an island instead of a line smaller pendants. Our lighting experts will work with your cabinet designer to help you select the appropriate shape, size, and quantity of light needed for your space. Since we are focusing on smart material choices in this post, we want to point out that these are actually foyer lights. Many times, smart choices come from the ability to think outside the box. 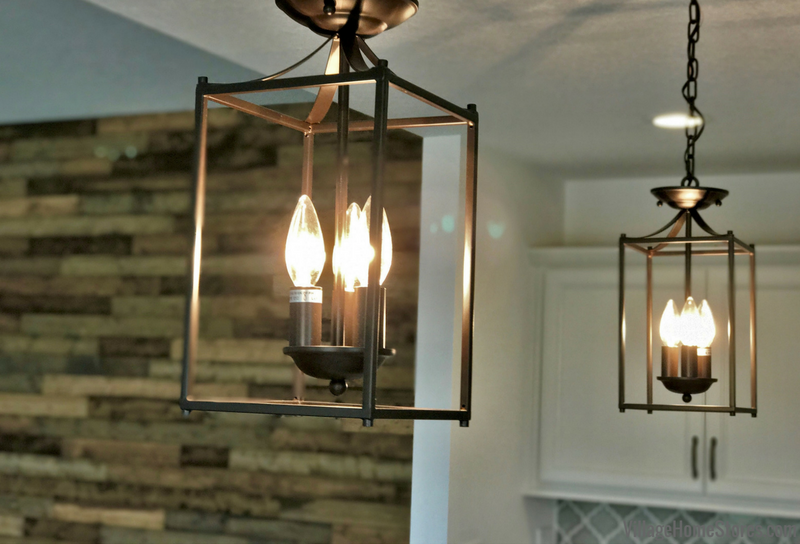 The lighting trend of 2-3 larger light fixtures above kitchen islands has often brought our lighting team to suggest foyer, dining, and even some outdoor lighting product for our clients. We carry thousands of lighting options and our experts will work with you to help narrow down your personal style and needs. 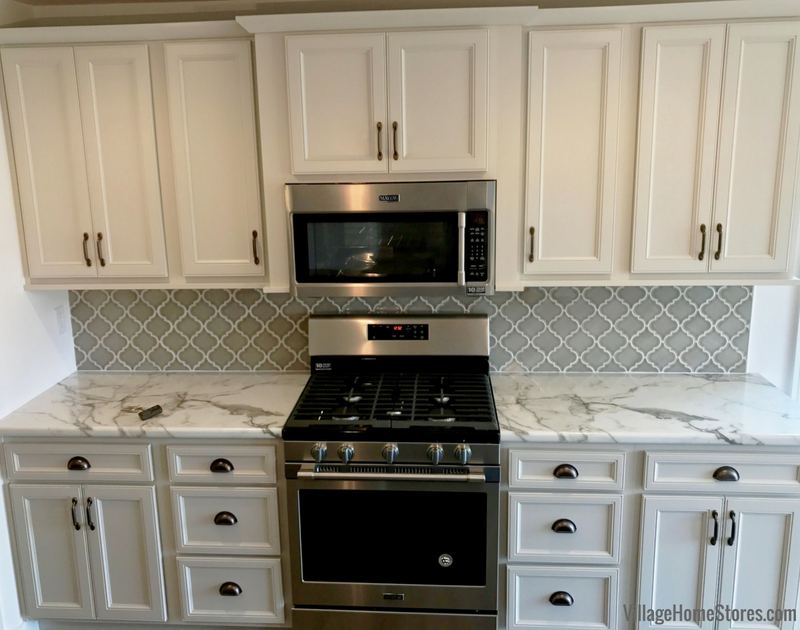 We love the clean look of the bright Oyster painted finish and the addition of 5-piece drawer fronts give a very classic look to the cabinetry. A 5-piece drawer front means that in place of a smooth, slab drawer with an outside edge you get the look of a small door. A framed edge with center panel. 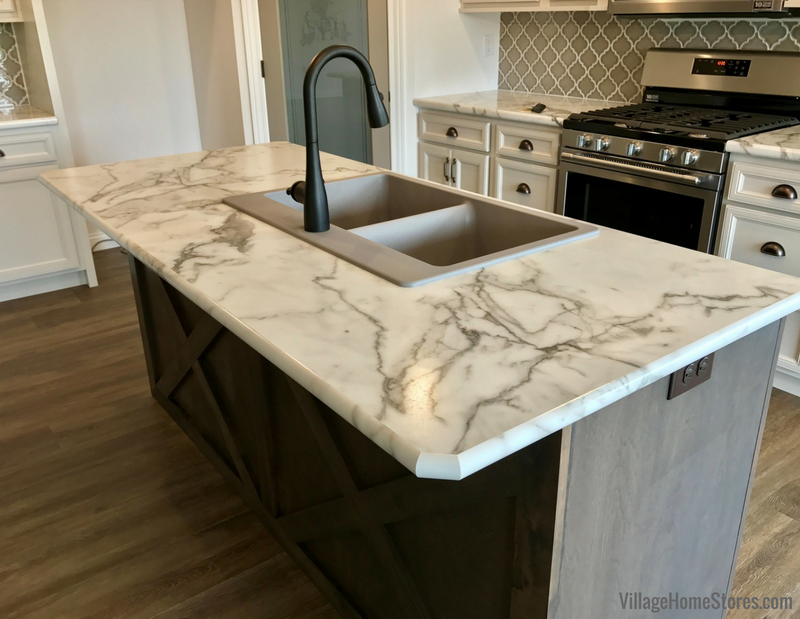 And nothing can be a more classic countertop choice than a white marble… but this isn’t marble. It isn’t stone at all! They are Formica laminate! 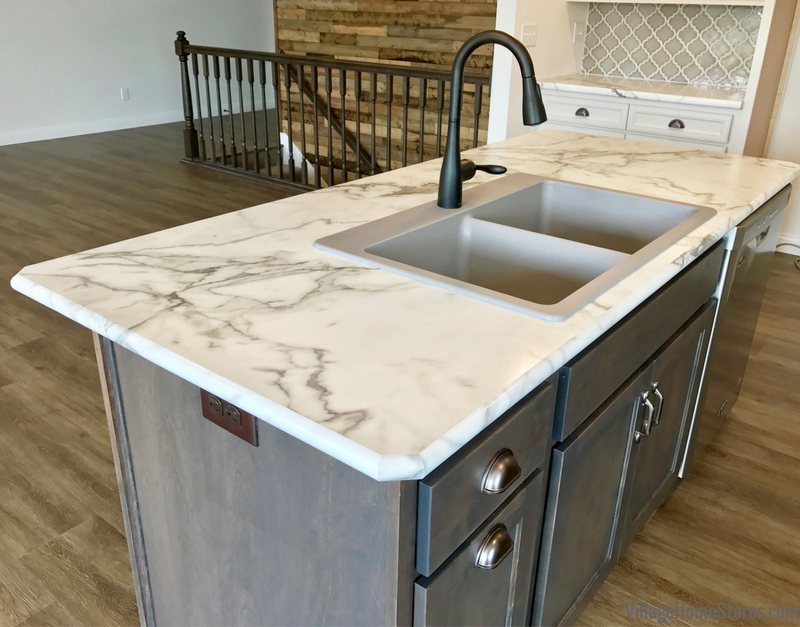 Formica’s “Calacatta Marble” design in the large-format print 180FX series gives a successful look of real marble at a fraction of the cost. We installed it here using what is called an “ideal” edge profile. That helps create even more of a look of a smooth edge to a slab of stone on the lengths of the top and even the corners. The durable Elkay drop-in sink used is another smart material selection. Think of how much use your kitchen sink gets. You need it to look great but also perform well. These granite composite options are available in so many colors now we can find just the right one to compliment your kitchen design. 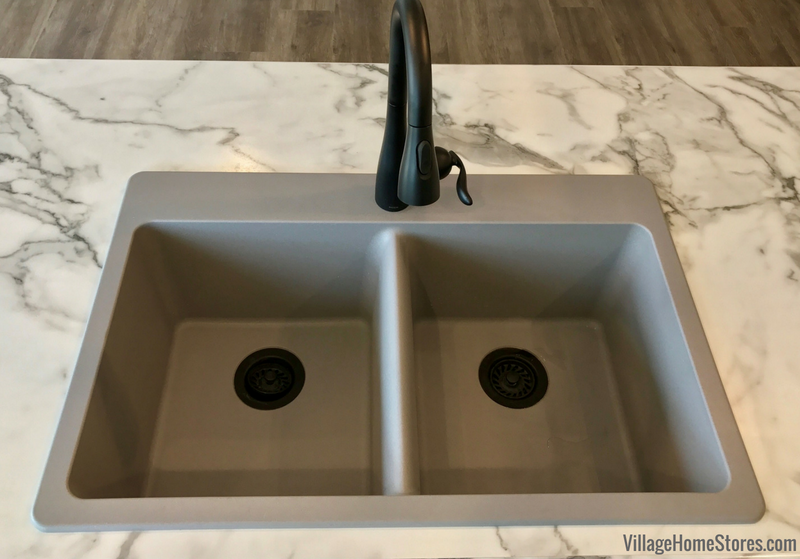 We also love the clean look of the faucet selected. A single hole fixture is easier to clean and helps to keep the island looking less cluttered. This model has a single lever control and a pull down sprayer. Laminate tops can be one of the smartest material decisions made when building a home. You can always return years later and replace your counters with an upgrade of material. That is a simpler project than changing out your cabinetry or flooring. 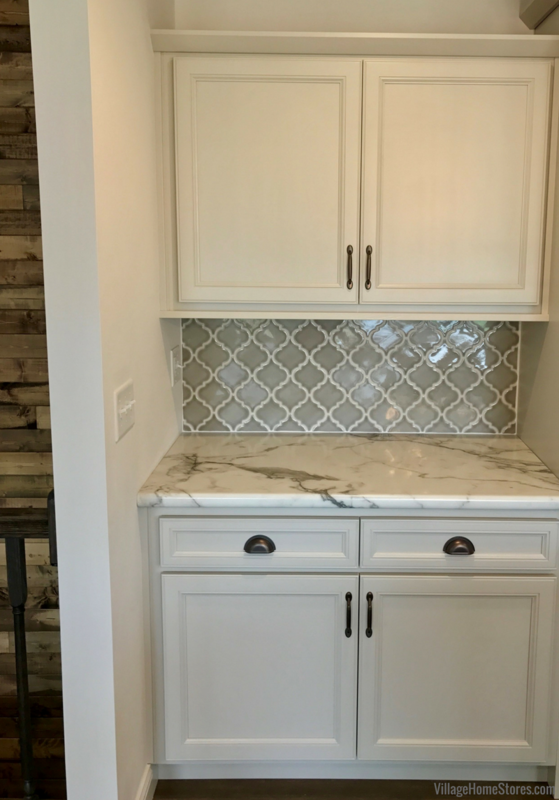 The flooring selected looks absolutely stunning when paired with the cabinet finishes and all of the other materials selected for the kitchen and great room. 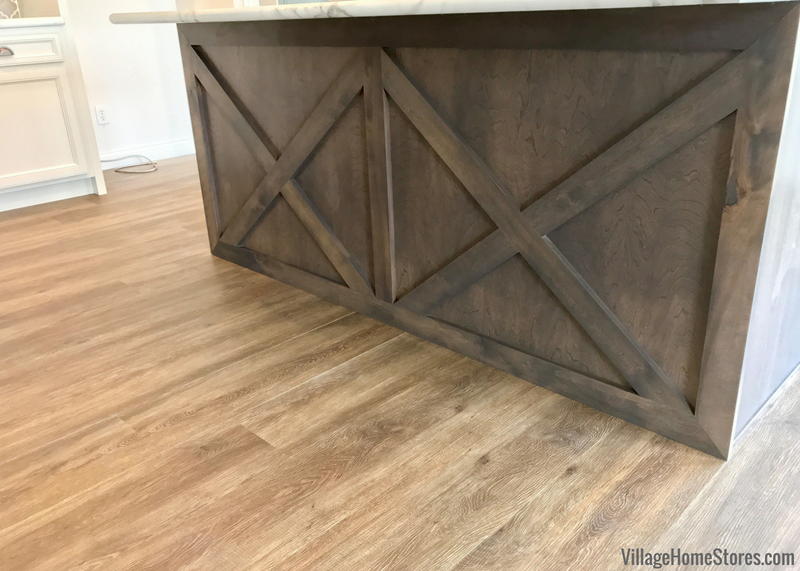 The flooring in this home is honestly one our favorite material investments made by these customers. Our COREtec flooring product is one of the very best flooring options we have available. The look of wood (or tile) in a high density, extra strong plank that is 100% waterproof, 100% kidproof, and 100% petproof! The luxury vinyl has an added wear layer for durability and it is bonded to a stable waterproof core made of bamboo and recycled woods. The COREtec in this kitchen is an embossed grain product from the Plus XL line named “Muir Oak”. The XL series means that the planks are extra wide (9″) for a bigger impact. Perfect for large, open spaces like this. There are so many varieties of COREtec available. this “Muir Oak” finish looks so great with so many cabinet finishes and styles. It also compliments many furniture finishes for spaces like this where you have a great room with many items atop the floors. A durable, dependable and stylish choice for flooring is always a smart choice. Those same qualities can be found in the appliance package selected for the kitchen. Maytag is known for it’s sturdy and dependable product. So much so that they now include a 10 year Limited Part Warranty on their products. These parts vary depending on the appliance category. For example, on the range shown above the cooktop burners, oven burners, cast-iron metal grates and cavity are all covered. Learn more about this range here on our website. Maytag builds products that can perform in your home using many commercial parts and techniques. That way they can perform for you for many years. This appliance suite also includes Maytag’s Fingerprint Resistant Stainless Steel. A true stainless steel that is easy to clean and keeps your kitchen looking great. Of course, above a hardworking 5-burner gas range you will need ventilation. 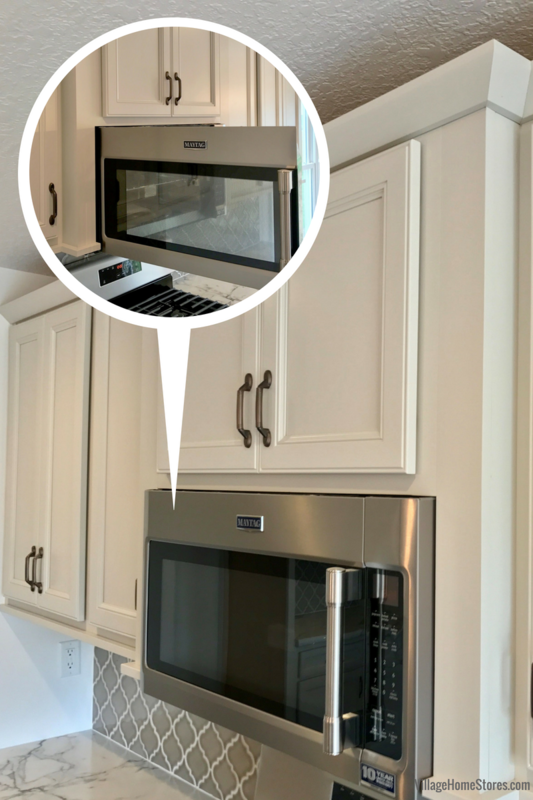 This microwave hood has a multiple speed exhaust fan to helps remove smoke and odors as you work in the kitchen. A mesh grease filter helps prevent messes and a charcoal odor filter removes high airflow odors and steam. Did you know that our store can save you time and money? Smart selections on materials from multiple departments at our “one-stop-shop” help our new construction customers earn FREE lighting for their home. 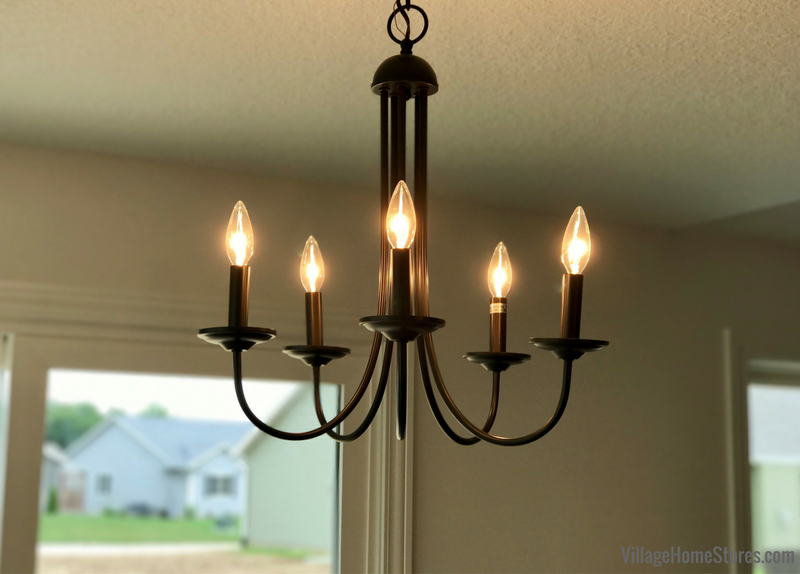 Working with our team of new home experts can help save you time during your design and bidding process and you can even take art of our lighting bundle program. The more you shop exclusively at our store, the more FREE lighting you can earn. Our lighting staff can walk you through this program and help you to plan ahead to make the most of your overall budget and get the lighting of your dreams! 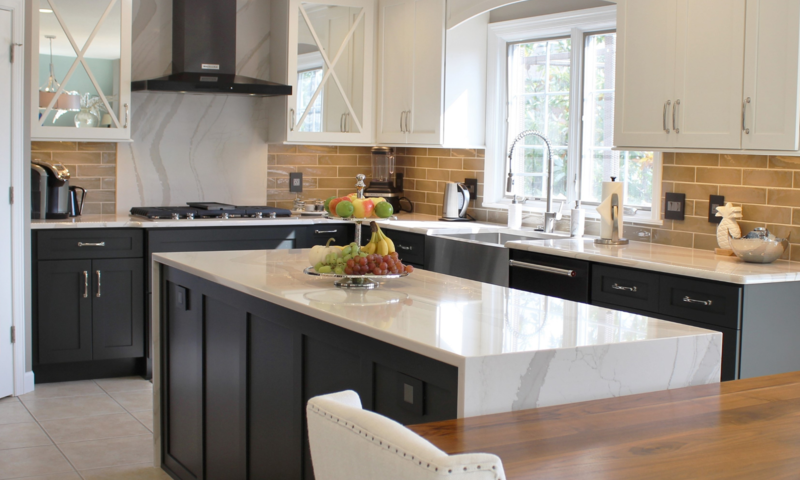 Of course we didn’t just provide product for the kitchen in this home, we designed spaces throughout the home. 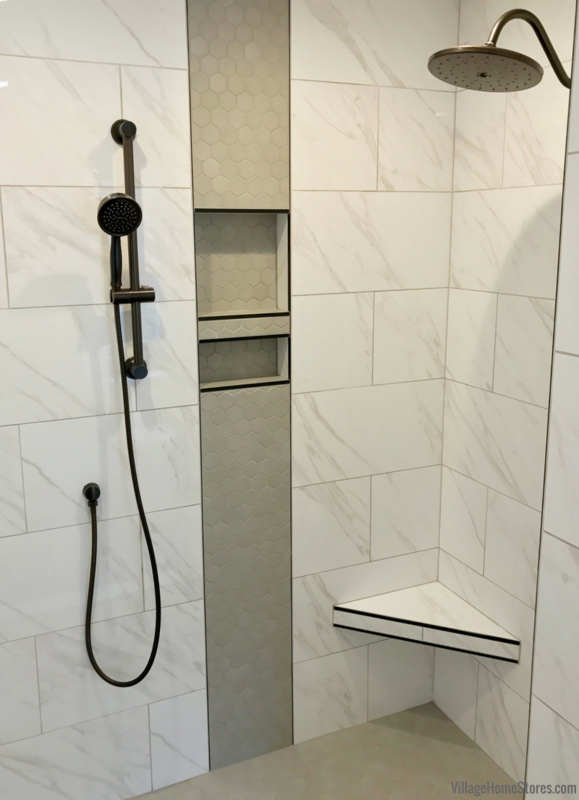 A custom tiled shower is atop many bathroom wish lists and the one in this home is amazing! We added interest by carrying the 2″ hexagon mosaic tiles up the wall in a stripe. Within that stripe we built in a custom niche area or toiletries. A corner bench of the walls adds another great feature to the tiled shower. Material selections are so important to be made with the overall vision of the space in mind. That is why shopping for product all in one location can help create the best overall look with the least amount of stress for you. 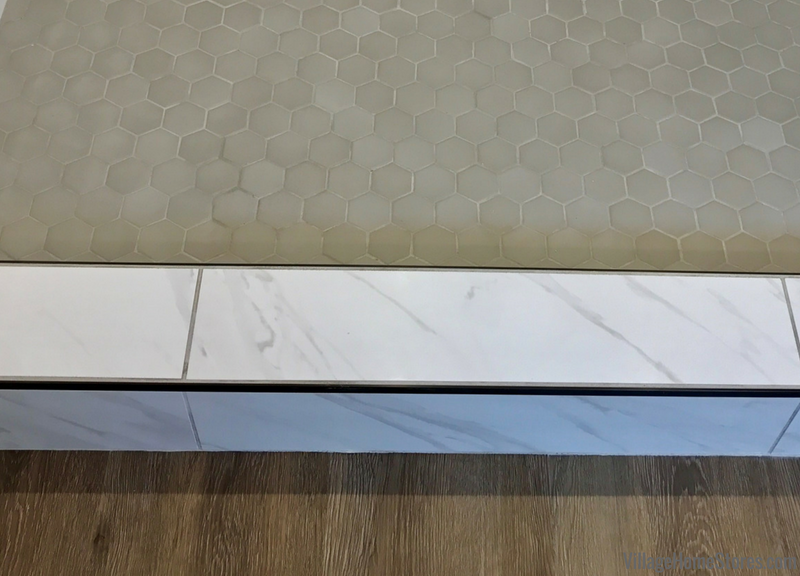 Not sure how the tile will look with the vanity top color? No problem! Let’s grab your cabinet designer and see what they think! Concerned about fitting that large-capacity refrigerator in your design? So is your appliance expert who can communicate with your designer all of the needed dimensions for the perfect fit. 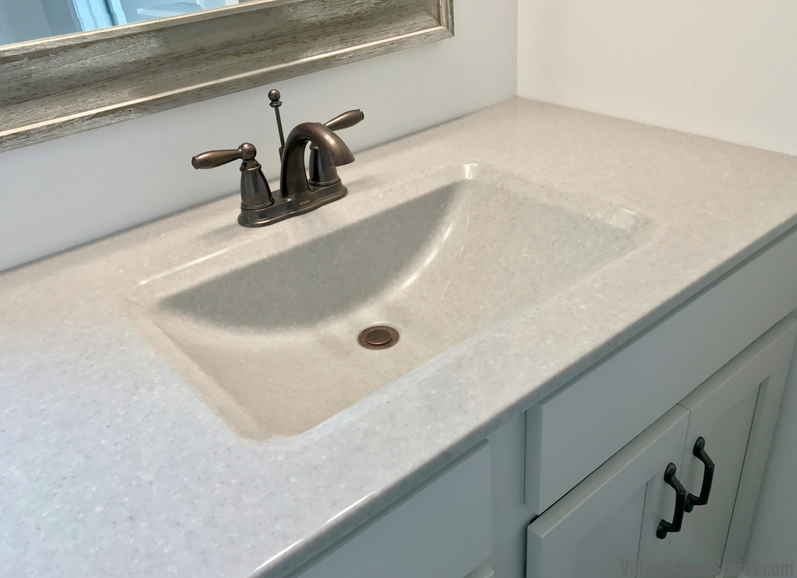 Our Onyx Collection vanity tops are another smart material choice. They are stylish, and very easy to clean. We can custom make any shape and size needed plus can even pout shower bases and walls to match. Many of our customers find that they already have standard molds available for what their design needs without needing a custom priced option. There are also so many great bowl options and colors to select from. Shown: the “Wave” bowl and “Cashmere” color in gloss finish. If you are interested in building or remodeling in the near future, we want to be a part of your project! Want to learn more about our Bundle Program to earn FREE lighting? Curious about the first steps in our remodel process? Just reach out to our team and we will be happy to answer your questions and get you started. 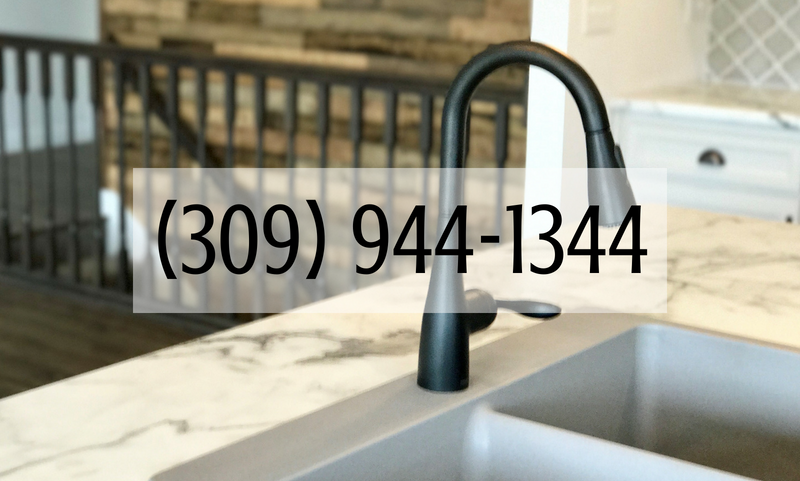 You can contact us at 309-944-1344 or by completing this short form online and a member of our team will be in touch. We can’t wait to hear what you are working on and how we can assemble a team just for you to help make your dream space a reality. Previous PostPrevious Coal Valley, IL- New Surfaces From Floor to Ceiling!